If you love meatball subs, you will love this easy casserole! 20 about meatballs, either homemade or purchased from the store. 1In a skillet, heat a couple of tablespoons of oil and place your meatballs in the pan to brown. 2When the meatballs are browned all over, pour the spaghetti sauce over them and allow to simmer a few minutes. 3Made garlic butter my using a garlic press to press the garlic clove into the butter and blending well. 4Prepare the french bread by slicing it horizontally. Spread half of the garlic butter on each side of the loaf. 5Put the halves of the garlic buttered bread back together and then slice it into slices. 6Pour the meatballs and sauce into a 3 quart casserole dish. Spread evenly into the casserole. 7Top the meatballs with the mozzarella cheese. 8Take the bread half slices and arrange them butter side up on top of the cheese. 9Sprinkle the Parmesan cheese over the top of the bread. 10Bake the casserole in a 350 degree F. oven for 30-40 minutes. 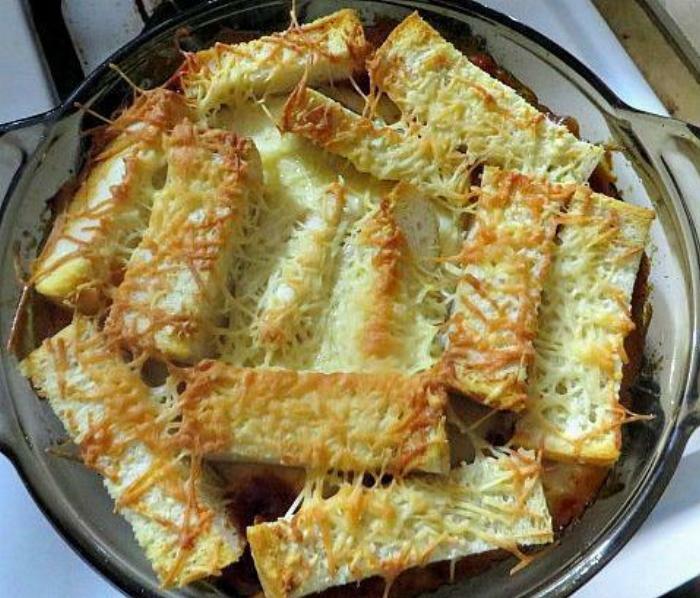 The cheese should be melted and the top of the bread with the Parmesan should be browned slightly and crisp. 11Serve by placing 2 or 3 pieces of bread in the serving bowl and then spooning the meatballs and sauce along side of the bread. There will be lots of cheese stretching with them! Kind of messy, but delicious!